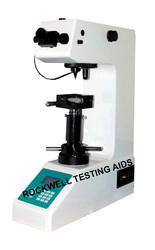 Prominent & Leading Exporter from New Delhi, we offer micro vickers hardness testing machine. BHT-1000 is Manual Turret Micro Vickers Hardness Tester adopts LCD screen to display. By mean ofcontrol keys, HV or HK hardness scales, testing force, dwell time can be selected and brightness oflight source can be adjusted. The hardness value is displayed directly by entering the indentationdiagonal length and avoids the complication of the look-up table. 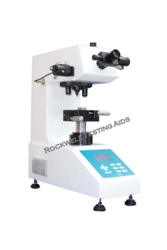 BHT-1000 is Manual Turret Micro Vickers Hardness Tester adopts LCD screen to display. By mean of control keys, HV or HK hardness scales, testing force, dwell time can be selected and brightness of light source can be adjusted. The hardness value is displayed directly by entering the indentation diagonal length and avoids the complication of the look-up table. Heat treated layer, carbonized layer, hardness hard layers, superficial Coating, steels, non-ferrous metal, micro and thin shaped components. Machine can be upgrade to computerized as camera port is provided on top of machine. Conversion to other scales HRA, HRB, HRC, HRD, HB, HR15N, HR30N, HR45N, HR15T, HR30T, HR45T. HT-1000D/ HT-1000AD Micro Vickers Hardness Tester has a more faster testing speed than other ordinary Micro Vickers hardness tester. The hardness value can be displayed directly and not need to enter the length of the diagonal. These models are famous for its fashion and decent design, high testing precision, stable functions and simple operation. Machine can be connected with computer. Machine can be upgraded to computerized as camera port is provided on top of machine. Conversion to other scales HRA, HRB, HRC, HRD, HB, HK, HR15N, HR30N, HR 45N, HR15T, HR 30T, HR45T. The testing data able to be printed directly by the built-in mini printer.